Several weeks ago I registered for the upcoming SCVWS show, "Red or Red." At the time I only had an idea for a painting in my head; its transition to paper was rocky, to say the least. I'm sorry to say that after working on it for 2 weeks, the patient could not be saved. It was a murky. overworked mess. Three days ago, I hurriedly scrambled to get this piece done. 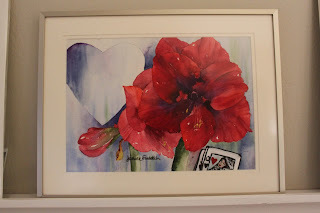 The cards were originally a rubber stamp I had carved; the practice prints turned out beautifully, but the money shot-the one on my painting- looked like a smear of tar on the paper. I had used acrylic paint for the stamp, so there was no way to eradicate the image. I went back in and tried to paint over it to "fix" it with mixed results. Framed, it looks better than I expected, luckily. Moral of the story: don't make up a name; that's what the word "Untitled" is for! Be sure to go by the Los Altos Library during the month of February to see 38 other very nice paintings, in addition to mine. Janice, Love the concept, and how you interperted it! Heart, red , red heart. Red amaryllis are one of my favorite flowers. Once again I am impressed with your creativity, making your own stamp? Glad to see you're still doing things the hard way! Good luck, hope you win a ribbon, or whatever they give out to the bestest painting in the show. Beatiful this flower! I like it very much! I tried many time but I find difficult paint this because is big and monocolour so .. I have to try again. This is like I would been able to paint. Thanks, Ann! Reds are difficult pigments with which to work, so I was happy with the result. Floriana- I do understand your English! I wrote a comment on your blog-your English is better than my Italian! Grazie mille per le tue parole gentile! Gorgeous Reds! it just pops with so much color and so true, red's are so difficult to work with. I really do like your clever design on this piece. Miss you Janice!